Where did I get it? I bought it, I had it on pre order and it arrived in January 2017. I meant to read it straight away but didn't, but while browsing my bookshelves recently I thought I really should get around to it. I'd heard so many good things about it so i was excited to read it. What's it about? Wing Jones lives in Atlanta, Georgia, with her mum, her two grandmothers, and her brother, Marcus. Wing is half Chinese and half Ghanaian and often feels like she's stuck between two worlds. She's quite shy at school, preferring to spend her time watching her brother, who is hoping to go pro, play football. She has a huge crush on Marcus' best friend Aaron but is certain nothing will ever happen between them. Then a tragedy befalls the family; I won't spoil it because I didn't know what it was, so when it happened I actually went, "No!" and had to put the book down for five minutes while I got over it. Wing is left reeling, unsure of what to do to feel better. So, at night, she starts to run, and she discovers a talent for running that no one knew she had. What age range is it for? 14 upwards, maybe fifteen. The storyline is quite difficult to read. Are any main characters LGBTQ+? She's not entirely a main character, but a friend of Wing's is, and I really liked this subplot. Are any main characters people of colour? Yes, obviously Wing's whole family are, and Aaron is black. Are any main characters disabled either mentally or physically? Sort of. Is there any talk of death? Yes, lots, and some of it is quite gory so take care. There's some gory violence too. What criticisms do I have? The timeline of the book was a bit odd. Some weeks seemed to last forever, and then time sprung forward without any warning and I didn't understand how or why. There were a couple of factual errors too, within the narrative, that just sort of jolted me. But honestly, there's very little to criticise because I really liked it. Why did I choose to read it at this point in life? Well, my eye was caught by the beautiful purple and pink sprayed edges of the book. All books should have coloured pages tbh. What other books is it like? 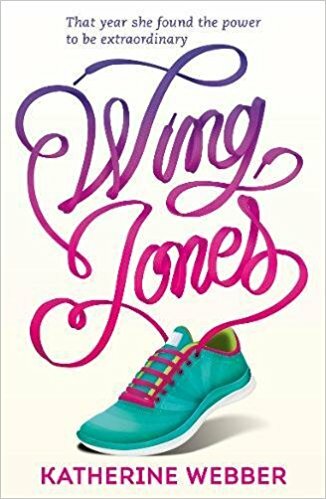 It's easy to draw a parallel between Wing Jones and The Hate U Give, one which is a fair comparison, but I also thought it was a lot like Not If I See You First. It might have just been the running but the feel - especially of Wing's experience at school - is very similar. How many stars? Nine out of ten, I really liked it. Where is the book going now? I want Lee to read it as I think he'll like it in the same way that he liked The Hate U Give. I also think my friend Stacey would enjoy it, so I might lend it to her over the summer.